The Morison Prize in Science, Technology, and Society (STS) recognizes the accomplishments of an individual who has made major contributions at the interface between science and technology on the one hand and matters of societal concern on the other. It was endowed by the family of the late Professor Elting Morison, a renowned historian who helped found the STS Program at the Massachusetts Institute of Technology (MIT) in the 1970s. Associate Professor Gregory Clancey, who received his PhD from MIT in 1999, was awarded the prize for his scholarly work on the history of technology in Asia (especially Japan) and the US, and for his efforts as a programme builder at the Faculty of Arts and Social Sciences, the Asia Research Institute and Tembusu College – all at NUS. On 11 May, Master Clancey was at MIT to deliver the Morison Prize Lecture. 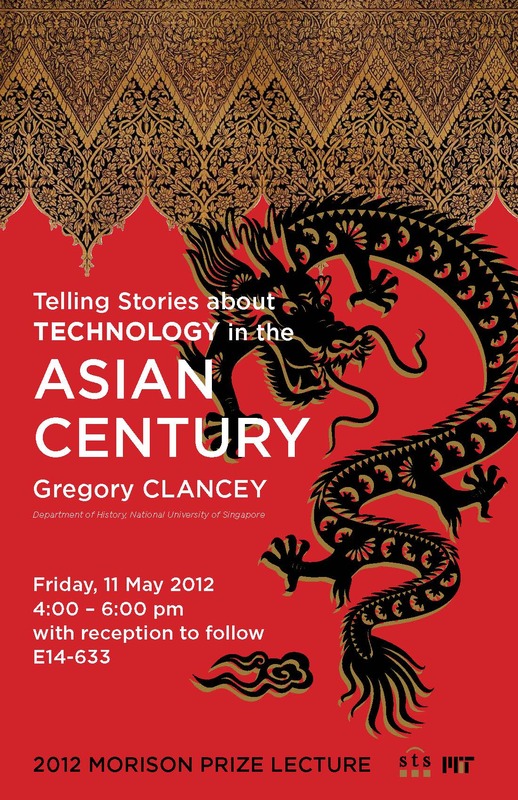 It was titled “Telling Stories about Technology in an Asian Century”.